I typically serve in a bowl, and have yogurt or labneh available to add as it is quite hot. The recipe is flexible, add or remove veggies and meat as desired. 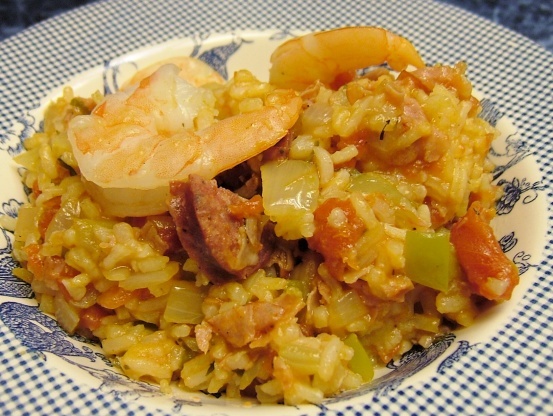 What makes it ‘this’ jambalaya recipe is the chorizo, wine, and lots of garlic. Brown the chorizo in a dutch oven. Remove meat from pan; leaving grease. Sautee garlic in the grease. Remove w/sausage to prevent scorching. Lightly cook chicken in the grease. Optionally add a handful of cherry tomatoes or a chopped tomato, or a can of crushed tomatoes. Optionally add any stray meat leftovers that you want to use up (not heavily sauced ones though). Add rice, chicken broth, and paprika. If you have fresh parsley add some of that too. Cover and bring to a boil, then lower to a simmer – cook as you would your rice, so ~25 minutes for white, ~45 minutes for brown. Turn off heat, add shrimp, replace cover and let sit ~10 minutes or so to heat the shrimp through and continue absorbing water. Note that it will still be wet when done! 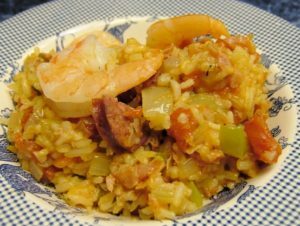 This entry was posted in Recipes and tagged chorizo, dinner, jambalaya on October 27, 2011 by Michelle.